Are those “real” healing potions? My boys are RPG (role playing game) enthusiasts. The younger generally enjoys giving a good thumping to something that sincerely deserves it or growing things (he is a dirt lover on and off the computer). The elder enjoys designing scenarios, cities, potions – he's always creating something. Lately, my favorite herb book, the Holistic Herbal, has been left out on the counter or kitchen table a lot as I am researching the properties of all the vegetation I've been gathering (this is my first season of doing more than dabbling). Number one son is a compulsive reader – books, magazines, packaging, over my shoulder while I'm typing – so of course he noticed “the book”. He is enthralled, and sets off immediately to gather odds and ends to brew his first concoction. We settle on steeping nasturtium leaves, as I figure they should be pretty harmless as people eat nasturtium as a salad green. I warn him not to experiment without checking with me first, as medicinal herbs are medicine. More is not necessarily better and they can have side effects. He is a pretty responsible kid, and has a near-photographic memory, so I'm glad to have him on board with my latest project. It's a nice tie-in to our botany and Latin studies as well. 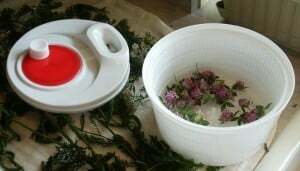 While he is steeping his brew, I wash up my latest round of herbs – yarrow, plantain and red clover. I lost my first batch of red clover due to improper drying – it fermented. I was impressed by the fumes coming out of the jar – wow! I talked about the properties of red clover in an earlier post. Things have been getting a little dusty in the garden, so I did do a cold water rinse, a ride in the salad spinner, and a pat dry with a towel before loading bits in the dehydrator. Note to self: badly overgrown lawn desperately in need of mowing very good for harvesting clover. The yarrow got the same treatment. I initially planted a couple of patches of yarrow four years ago. Now it's popped up all over the place, so I have more than enough for my needs and sharing with others. 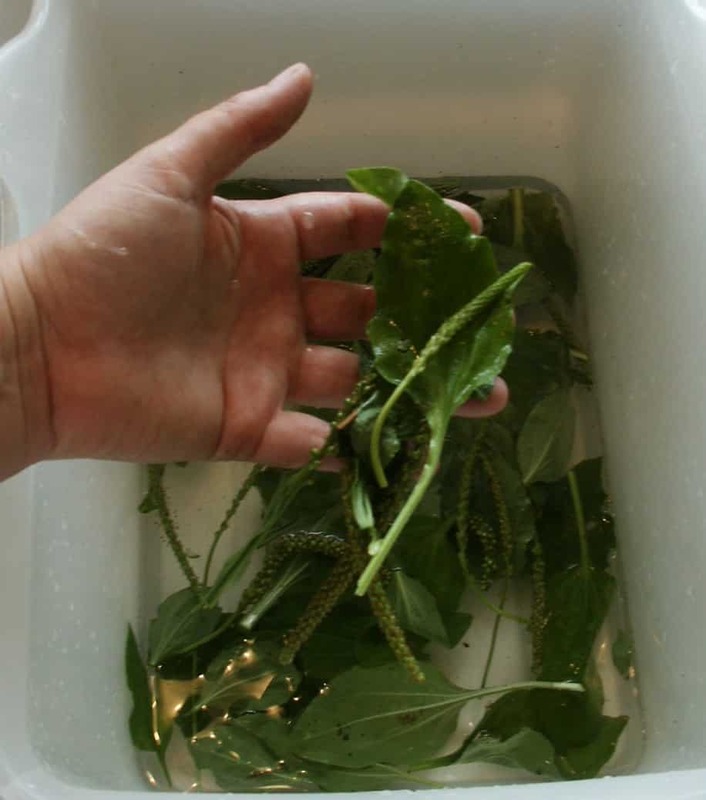 The plantain was washed and divided between the dryer and an olive oil infusion. Habitat: Yarrow is a perennial herb, native to Europe and Asia and naturalized in North America and most other countries throughout the world. Yarrow is very common along roadsides and in old fields, pastures, and meadows in the eastern and central United States and Canada. Cultivation: Yarrow is easily cultivated, will survive in poor soil. Prefers a well-drained soil in a sunny position. A very good companion plant, it improves the health of plants growing nearby and enhances their essential oil content thus making them more resistant to insect predations also improves the soil fertility. Description: Yarrow grows from 10 to 20 inches high, a single stem, fibrous and rough, the leaves alternate, 3 to 4 inches long and 1 inch broad, larger and rosette at the base, clasping the stem, bipinnatifid, the segments very finely cut, fern-like, dark-green, giving the leaves a feathery appearance. The flowers are several bunches of flat-topped panicles consisting of numerous small, white flower heads. Each tiny flower resembling a daisy. The whole plant is more or less hairy, with white, silky appressed hairs. Flowers bloom from May to August. Gather stem, leaves and flower heads in bloom, dry for later herb use. Dry herb edible as a spice or flavoring, strong sage flavor. Properties: Yarrow is a very valuable medicinal herb, with much scientific evidence of use in alternative medicine as an antiseptic, antispasmodic, astringent, carminative, diaphoretic, digestive, emmenagogue, stimulant, and tonics, vasodilator and vulnerary. Yarrow is used against colds, cramps, fevers, kidney disorders, toothaches, skin irritations, and hemorrhages, and to regulate menses, stimulate the flow of bile, and purify the blood. Medicinal tea is a good remedy for severe colds and flu, for stomach ulcers, amenorrhea, abdominal cramps, abscesses, trauma and bleeding, and to reduce inflammation. The main constituents are volatile oils including linalool, camphor, sabinene, and chamazulene, sesquiterpene lctones, flavanoids, alkaloids including achilleine, polyacetylenes, triterpenes, salicylic acid, coumarins, and tannins which prove these uses in alternative medicine to be effective. Extracts of yarrow exhibit antibiotic activity and may also act as anti-neoplastic drugs. Externally for treating wounds and stopping the flow of blood. Yarrow oil has been traditionally used in hair shampoos. Some caution is advised , large or frequent doses taken over a long period may cause the skin to be more sensitive to sunlight. Folklore: It was one of the herbs dedicated to the Evil One, in earlier days, being sometimes known as Devil's Nettle, Devil's Plaything, Bad Man's Plaything, and was used for divination in spells. Recipe: An aromatic tea: To 1 tsp. dried herb add 1 cup boiling water, steep for 10 min. sweeten to taste. Take at bedtime. Plantain is a perennial herb, thought to be of Eurasian origin and now naturalized throughout the world. Plantain is considered a common and noxious weed by some and a miracle plant by others. Plantain is very easy to cultivate, it succeeds in any soil and prefers a sunny position, some forms have been selected for their ornamental value. It is an important food plant for the caterpillars of many species of butterflies. Plantain grows from a short, tough rootstock or rhizome, which has a large number of long, straight, yellowish roots, is a basal, rosette of large, broadly oval, dark green, leaves. The 4 to 10 inch long smooth, thick, strong and fibrous leaves have 3 to 7 or more ribbed veins, abruptly contracting into a long, petiole (leaf stalk) which is reddish at the base. The leaf margin is of Plantain is entire, or unevenly toothed. The flower stalks, are erect, long, slender, densely-flowered spikes. Each tiny flower is brownish and bell-shaped with four stamens and purple anthers. Flowers bloom most of the summer. The fruit is a two-celled capsule and containing four to sixteen seeds. 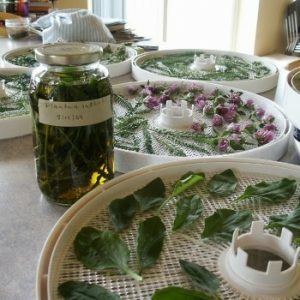 Harvest fresh young edible leaves in spring. Gather Plantain after flower spike forms, dry for later herb use. Plantain Medicinal Properties and Herbal Use: Plantain is edible and medicinal, the young leaves are edible raw in salad or cooked as a pot herb, they are very rich in vitamin B1 and riboflavin. The herb has a long history of use as an alternative medicine dating back to ancient times. Being used as a panacea (medicinal for everything) in some cultures, one American Indian name for the plant translates to “life medicine.” And recent research indicates that this name may not be far from true! The chemical analysis of Plantgo Major reveals the remarkable glycoside Aucubin. Acubin has been reported in the Journal Of Toxicology as a powerful anti-toxin. There are many more highly effective constituents in this plant including Ascorbic-acid, Apigenin, Baicalein, Benzoic-acid, Chlorogenic-acid, Citric-acid, Ferulic-acid, Oleanolic-acid, Salicylic-acid, and Ursolic-acid. The leaves and the seed are medicinal used as an antibacterial, antidote, astringent, anti-inflammatory, antiseptic, antitussive, cardiac, demulcent, diuretic, expectorant, haemostatic, laxative, ophthalmic, poultice, refrigerant, and vermifuge. Medical evidence exists to confirm uses as an alternative medicine for asthma, emphysema, bladder problems, bronchitis, fever, hypertension, rheumatism and blood sugar control. A decoction of the roots is used in the treatment of a wide range of complaints including diarrhoea, dysentery, gastritis, peptic ulcers, irritable bowel syndrome, haemorrhage, haemorrhoids, cystitis, bronchitis, catarrh, sinusitis, coughs, asthma and hay fever. It also causes a natural aversion to tobacco and is currently being used in stop smoking preparations. Extracts of the plant have antibacterial activity, it is a safe and effective treatment for bleeding, it quickly stops blood flow and encourages the repair of damaged tissue. The heated leaves are used as a wet dressing for wounds, skin inflammations, malignant ulcers, cuts, stings and swellings and said to promote healing without scars. Poultice of hot leaves is bound onto cuts and wounds to draw out thorns, splinters and inflammation. The root is said to be used as an anti-venom for rattlesnakes bites. Plantain seeds contain up to 30% mucilage which swells in the gut, acting as a bulk laxative and soothing irritated membranes. The seeds are used in the treatment of parasitic worms. A distilled water made from the plant makes an excellent eye lotion. Plantain Herbal Folklore and History: Native Americans carried powdered roots of Plantain as protection against snakebites or to ward off snakes. Plantain was called Englishman's Foot or White Man's Foot as it was said to grow where ever their feet touched the ground – this is referred to in Longfellow’s ‘Hiawatha.'. Some old European lore states that Plantain is effective for the bites of mad dogs, epilepsy, and leprosy. In the United States the plant was called ‘Snake Weed,' from a belief in its efficacy in cases of bites from venomous creatures. “Medicinal” herb tea: For colds and flu use 1 tbls. dry or fresh whole Plantain (seed, root, and leaves) to 1 cup boiling water, steep 10 min. strain, sweeten. Drink through the day. Healing salve: In large non-metallic pan place 1lb. of entire Plantain plant chopped, and 1 cup lard, cover, cook down on low heat till all is mushy and green. Strain while hot, cool and use for burns, insect bites, rashes, and all sores. Note: used as night cream for wrinkles. Here are the trays, loaded and ready to go. Aren't they pretty? The infusion goes into the kitchen window with the clary sage, mullein and St. John's wort. I've also dried some more mullein and clover. The dehydrator is running a lot lately. I think I'm about halfway through my wish list, but if time allows I may stash more of things I have already harvested, just in case (and to try more recipes in the winter when I have more time). I'm especially interested in trying out different healing salves for my mom, who has s skin condition that has been resistant to all treatments that have been tried on it. I think it was helpful but do you think that there is any concoctions I should avoid? There are thousands of plants out there, and many can make you sick or seriously ill.
Oh my goodness! We would get along sooooo well. Loving those wonderful wilds that grow in our yard; encouraging them to grow instead of "pulling a weed." 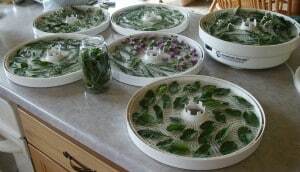 I haven't used the dehydrator on my herbs yet, it's a good idea, don't know why I haven't yet. I can't wait to see more of your earthly love! Lisa – we don't spray, so it's definitely a good idea to make friends with the "weeds". Our garden may look a bit like a mad jumble, but it's organized chaos. (That's my story and I'm sticking to it.) Also, if you learn to eat/use a wider spectrum of foodstuffs, something is always bound to produce, no matter what the weather. I hope it's OK, but I printing out this information! It's great that the kiddos are learning the natural way to be healthy! LOVE that serious hands on training for your kids. Couldn't get a better education than that if you tried! Laura – check back w/ the original sites I quoted the information from – they have a lots more info on a wide variety of plants. Lo – I tried the plantain tea when my youngest had a cold. I couldn't get him to drink much, but I finished what he didn't and it was quite tasty. My tea ball is finally getting a work out this year. I wonder if I could use it to brew kombucha? Those trays look beautiful indeed! I've search for Plantain in my back mountain side, but to no avail. Perhaps it will come up a little later in the season? I need to take a hike and find some of this stuff! Not sure what zone you're in, but it does grow all over the US (this link has a map: http://www.woodrow.org/teachers/bi/2000/Ethnobotany/common_plantain.html). Mine isn't growing here yet, but then again nothing much is growing here just yet. There was still ice on the puddles this morning – brrr! I can't believe that this time last year I had greens planted in the garden for almost a month by this time. This year those beds are sodden and frozen. I am going to start growing herb this year. Great information! Amy – if you can't find plantain growing wild in your area, Mountain Rose Herbs sells plantain seeds that you can grow in your home garden. I just added a link to their site on the sidebar. Nicole – link is fixed. Thanks for letting me know. I moved my blog over from blogger at the beginning of the year, and occasionally find a link that doesn’t redirect properly. You have made my morning coffee much more enjoyable today! My kids work right along side me and use what we harvest, so I try to research thoroughly and experiment carefully. I would be interested in knowing what your mother’s problem was, and what if anything you discovered helped. If you are free to share. Personally, I made a salve with Plantain, that seemed to help a lot with spider bites. I think my granddaughter attracts spiders! There are links at the bottom of the post to make the plantain infused oil and salve from the infused oil. I wish i had access to the knowledge you have. I would love to learn more about potions and sauves and magical brews. I do so much magic with plants. The humans around here have not a clue. I work magical wonders. That appear to defy reality. I have helped many with my simple ointments, But can never seem to find any true to blue books on herbs and botanical brews. All are from video games and fabricated fakes. its only legal with a green card and would have to register if you wanted to grow it. I grow natural wild herbs like lavander and clovers and arnica. Nothing drug level or illiegal. I would deeply appreciate knowing when you publish the updates on your mother’s story. Thank you so much.